What is an Educational Service Center (ESC)? The Summit Educational Service Center (SESC) was first established as the Summit County Board of Education in 1914 when Ohio's 80th General Assembly sanctioned the founding of a county board of education for each of the 88 counties in Ohio. The primary aim of a county office was to provide administrative management and leadership to local school districts, the majority of which were small. County offices, as intermediate agents between the State Department of Education and the districts, have moved from being primarily administrative and regulatory agencies for local school districts to providers of necessary services and consultation for both local and city school districts. They provide effective, efficient, and economical services which districts might have difficulty providing on their own or work with districts on collaborations and consortiums that help provide needed services. Some county offices have joined together so that today there are 66 educational service centers. This organization is dedicated to providing administrative, curricular, instructional, instructional technology, pupil personnel, and professional development services to the schools of Summit County and assisting them in reaching their educational objectives. These services are primarily designed to assist boards of education, administrators, teachers, and other staff members so that they may provide engaging work to students and services that help students learn. 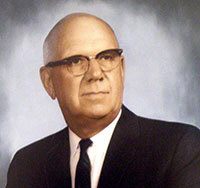 Dr. Carl Cofeen, Summit County Board of Education Superintendent 1935-1962. First located in downtown Akron, the Summit County Board of Education relocated in August, 1992, to its present location at 420 Washington Avenue in Cuyahoga Falls. This move nearly tripled the amount of available floor space and provided SESC with the ability to arrange more workshops and provide meeting space for districts. With the 1995 legislation change, we were renamed as the Summit County Educational Service Center. In 2016, our organization changed its name to the Summit Educational Service Center. This change was made for two reasons. One was to simplify our name and alleviate confusion with being incorrectly associated with the government of the County of Summit. The second reason of the name change was to reflect that we provide services to schools throughout the state, and not only those located within Summit County. SESC staff is dedicated to providing leadership in the areas of staff development, in-service, technological developments, student development, curriculum and instruction development, current educational processes, legal developments, and fiscal developments. The Summit Educational Service Center is committed to providing leadership and service in education. The sixteen districts served by the Summit ESC represent approximately 53 thousand children in grades K-12.